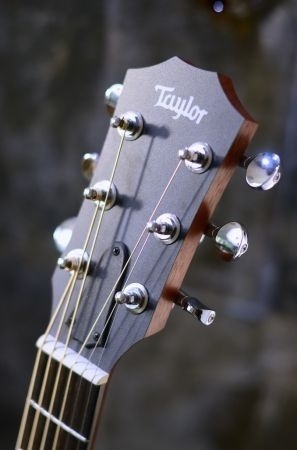 It’s a Taylor GS Mini. I purchased it on Craigslist from a guy who won it in a photo contest for Taylor. 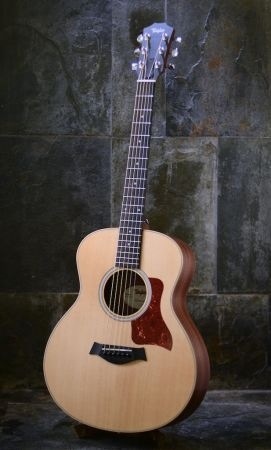 For as long as I can remember I’ve wanted a Taylor guitar, and I’m so excited to finally have one. Over the past month I’ve been cleaning out my closet and selling stuff to raise the money for it. I even parted ways with two of my guitars. You might wonder why I would want a mini guitar. Part of what excited me most about the GS Mini was its small size. At 7/8 scale, it’s a great size for sitting on the couch. Gone are my dreams of being a rock star, so a full sized guitar wasn’t necessary. Anyway, I’m really excited about it. If you can’t tell.